1. What is a mule? Surprisingly little has been recorded about the misunderstood mule, and this book is the most comprehensive available, dispelling many of the popular myths associated with this man-made hybrid. Mules have been bred for around 3,000 years, because not only do they inherit the best qualities from each parent - the strength and speed of the horse, the stamina and patience of the donkey - but have in addition unique and mysterious qualities which are pure mule. The history of the mule is covered, with special emphasis on its use for military purposes, where it has been found invaluable over the centuries. 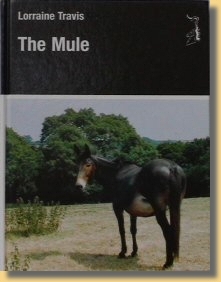 A fascinating chapter examinies the scientific aspects of a hybrid, and details the recently proven and intriguing facts about the occasional fertility of mules. Mules are slightly but significantly different in their breeding, care and training from horses and donkeys, and anyone contemplating walking with mules will find good advice here. Whether under pack, in harness or under saddle, mules are exceptionally intelligent and capable servants, but also affectionate and sometimes hilarious friends. This book makes highly interesting, enjoyable and instructive reading not only for the mule enthusiast but also for historians and breeders of the horse and donkey. Having ridden and driven horses and donkeys für many years, Lorraine Travis was given her first mule in 1976, and soon became fascinated by them - to the extent that she now hag six. The lack of information available on mules led her, in 1978, with the assistance of The Hon. Robin Borwick, to found the British Mule Society, of which she is the Honorary Secretary. She also edits The Mule, the society's quarterly journal, for which she both collects material worldwide and writes. She contributes articles on mules and driving borges to various publications in Britain and abroad, and is editor of the British Driving Society's journal and of its news page in Carriage Driving. She has presented her mules on television and given talks on the subject on radio. She lives with her husband on a small farm in the Staffordshire Moorlands. Lorraine Travis is the founder of the British Mule Society, and until recently she was its Secretary. I know her well, and have enjoyed working alongside her on BMS business. This book is a gold mine of information about mules, and is profusely illustrated with black and white photos. Chapter 2 covers the history of mules from the earliest reference to them about 3,000 years ago. It follows their spread through Europe and into the New World. The mule was used for military purposes from the beginning, and Chapter 3 starts with the ancient Greeks and contains a great deal of information about the use of mules in both World Wars. Chapter 4 deals with the infertility of mules, a subject which fascinates many people in both the mule community and the scientific community. Chapter 5 deals with buying and breeding mules, and their general management and training. The final chapter looks at the distribution and uses of mules throughout the world today. If you only have one mule book, make it this one!